Seventy-five years after New York Yankees icon Lou Gehrig gave his “The Luckiest Man on the Face of the Earth” speech, amyotrophic lateral sclerosis (ALS) has captured an unprecedented amount of attention. The rapid awareness of ALS isn’t due to Major League Baseball’s poignant commemoration of Gehrig’s early retirement over the July 4th holiday. Rather, it’s attributed to another ball player, Pete Frates, who was diagnosed with ALS in his 20s. Since mid-July, a dare issued by Pete’s friends has gone viral thanks to video and the Web. The #ALSIceBucketChallenge has spurred thousands of people to create videos shared across social media challenging others to dump a bucket of ice water and / or donate to an ALS-related organization. To date, $15 million has been raised for ALS, a disease that affects 30,000 here in the United States. The general public’s perception of this disease has grown exponentially thanks to 1.2 million videos shared across Facebook and over 2.2 million Twitter mentions. Organizations dedicate significant budget in an attempt to achieve the results generated through this grassroots campaign. Marketers can best utilize video, the star of any campaign, by implementing some of the following 5-points highlighted by the Ice Bucket Challenge. Due in part to donated services, Bissonnette’s budget was a mere $175. Logistics aside, Bissonnette’s video serves as an excellent example of how the 80/20 rule can be applied to a range of video marketing efforts. 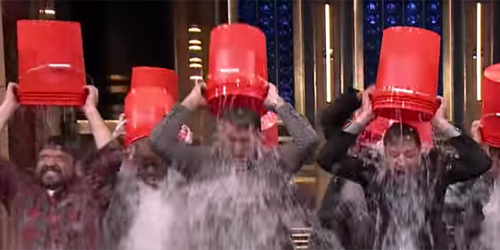 The Ice Bucket Challenge illustrates how video content can be the star of any organization’s marketing campaign, but works particularly well for a nonprofit like ALS. And if your organization can leverage just a fraction of the influence the ALS Ice Bucket Challenge has generated with their 5 point video content marketing campaign, you’ll be doing alright. There has been some criticizing of the campaign for people clicking and posting with little actual impact on the cause. The fact of the matter is that this backlash by a smattering of media outlets and individuals means the campaign truly had an impact and any charitable organization would take a 680% increase in donations. In the video Pete Frates makes the appeal, “The story right now goes: You get ALS, have it for a little while, a long while, but either way, the end is always the same. ALS always wins. So in order to rewrite the end of it, we need to raise awareness, money.” Well done sir and THAT is what the #ALSIceBucketChallenge is TRULY all about.